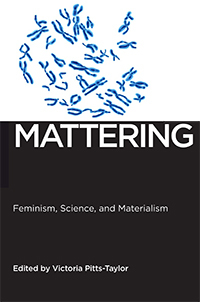 This volume insists that feminist theory can take matter and biology seriously while also accounting for power, taking materialism as a point of departure to rethink key feminist issues. The contributors, an international group of feminist theorists, scientists and scholars, apply concepts in contemporary materialist feminism to examine an array of topics in science, biotechnology, biopolitics, and bioethics. These include neuralplasticity and the brain-machine interface; the use of biometrical identification technologies for transnational border control; epigenetics and the intergenerational transmission of the health effects of social stigma; ADHD and neuropharmacology; and randomized controlled trials of HIV drugs. Pitts-Taylor also is the author of The Brain’s Body: Neuroscience and Corporeal Politics published by Duke University Press in July. 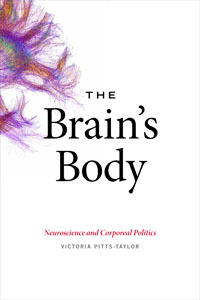 In The Brain’s Body, Pitts-Taylor brings feminist and critical theory to bear on new development in neuroscience to demonstrate how power and inequality are materially and symbolically entangled with neurobiological bodies. Pitts-Taylor is interested in how the brain interacts with and is impacted by social structures, especially in regard to race, class, gender, sexuality, and disability, as well as how those social structures shape neuroscientific knowledge. Pointing out that some brain scientists have not fully abandoned reductionist or determinist explanations of neurobiology, Pitts-Taylor moves beyond debates over nature and nurture to address the politics of plastic, biosocial brains. She highlights the potential of research into poverty’s effects on the brain to reinforce certain notions of poor subjects and to justify particular forms of governance, while her queer critique of kinship research demonstrates the limitations of hypotheses based on heteronormative assumptions. In her exploration of the embodied mind and the “embrained” body, Pitts-Taylor highlights the inextricability of nature and culture and shows why using feminist and queer thought is essential to understanding the biosociality of the brain.